Went on a service call for a Fisher Paykel dishdrawer yesterday. Complaint was that the lower drawer would not start up. Diagnosis confirmed the complaint, the drawer would act as though it wasn’t closed all the way, would just give not-ready beeps when you closed it and pressed start. I put the drawer into diagnostic mode by pressing and holding the Key Lock and Start buttons simultaneously. In diagnostic mode, I could review the current and previous error codes. Current code showed U2, drawer not closed error. 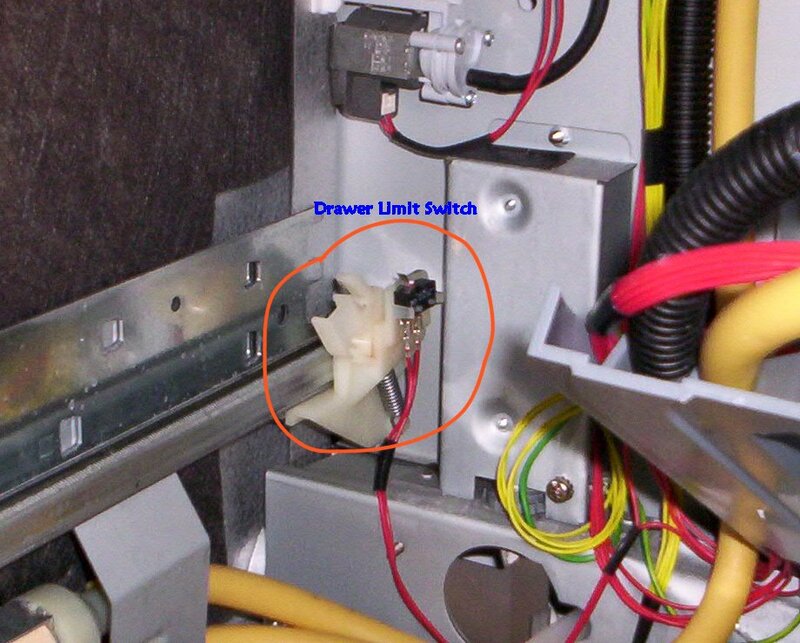 The prime suspect in this case is always the drawer limit switch. On the DD602’s, the limit switch is located on the very back of the left drawer guide which means, you guessed it, the drawer needs to come out. If you’ve not removed a drawer from a DD602, you’re in for a joy ride. This article has details on how to do it. Fisher Paykel has made several improvements in the DD603 models which have been gratefully received by Fisher Paykel servicers. The drawer linkage is chief among them. It’s actually not that bad, you just have to be patient and methodical. Anyway, with the drawer out, the problem was plainly visible, as seen in the thumbnail photo below. Click it for a larger view. 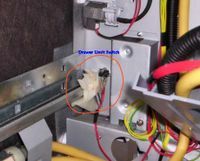 Fisher Paykel DD602, broken drawer limit switch. You can see that the actuating lever on the switch has been broken and bent upwards, so it can no longer depress the switch button. Consequently, the dishdrawer’s CPU never knows the drawer is closed. This entry was posted in Dishwasher Repair on June 10, 2005 by Samurai Appliance Repair Man. I too had this problem, after replacing the switch I got two wash cycles out of the drawer then got a F7 code. What if anything did I do/not do to cause this and what is the fix. I had to unplug the power “line” wire harness to stop the constant beeping. Any thoughts and thanks in advance. Best case is a broken hardware communications link from the console to the motor microprocessor. This could be a bad wire harness, or maybe you misplaced one of the wire harnesses on the motherboard. Worst case is a crashed control board = gotta buy a new one. My Fisher Paykel makes a loud sort of grinding noise during the first cycle. It sounds terrible. Any thoughts what it might be? You probably have some gookus stuck in the impeller. Pull off the spray arm and unlock the wash impeller assembly retaining ring. The whole assembly pulls right out. Look for deformations in the impeller vanes and/or gookus in the volute. Try buying directly from Fisher Paykel. You could also try to match up the switch at an electronic supply house. have DD603 Paykel Fisher dishwasher…one month old…Lowes has service man coming maybe next week when they can find one in our area…problem..washing both drawers and got F1 for flood switch activated…..lids didn’t close..overflowed anyway…water on the floor…had to cut power at circuit breaker to stop F1 flashing….is there any way to reset this malfunction?…I am not impressed with the P & F drawer design…not worth the $1500 price tag. Have a DD603 Fisher Paykel dishwasher. No service in our area. Dishwasher won’t drain and then leaks all over the floor. Any suggestions.